Hi, more memories & some family background. My parents Bill & Ada Webster née Booy (her father was a Dutchman) was married in 1918 at St Luke’s Church by vicar Gerald Wreford Brown my father would have either still been in the army or just demobbed. 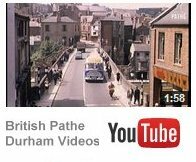 At that time my mother was living at 341 Railway St Broompark and my farther at 7 South View Ushaw Moor. My farther became a miner and always worked down the pit with his younger brother my uncle David, both played in the Salvation Army band life was good, but tragedy happened when my father saw his brother killed while working the same seam down the pit, he was only 21yrs my father was so effected by this he never worked again for a number of years. Hi, I am Jean Quigg (née) Webster I now live in Sydney Australia and have been here for 37 yrs, but I still have so many vivid childhood memories of Ushaw Moor I could write a book. I was born in 1933 at 48 Temperance Tce to Bill & Ada Webster the youngest of 5, my mother was a salvationist so the Salvation Army played a big part in our family life, my mother would don her uniform and go to the Top & Bottom pups every Saturday night to sell the War Cry paper and was always encouraged to sing the old rugged cross in both pubs. My childhood friend was Phillis Mountain who lived in Walton buildings and I would love to make contact with her or her family. Most of my memories are of the war years and how it effected out lives at school and at home. 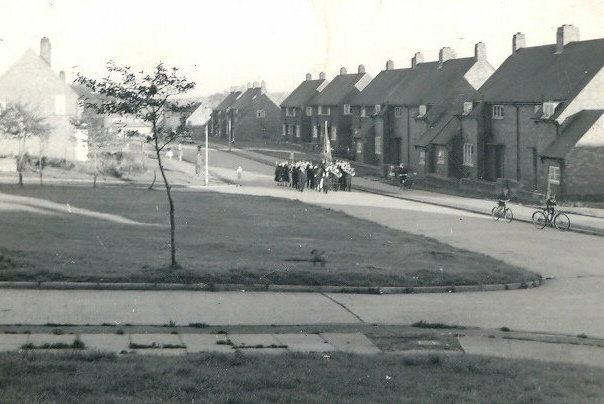 This photograph was taken from my grandmothers house in Whitehouse court in the late 1960′s. 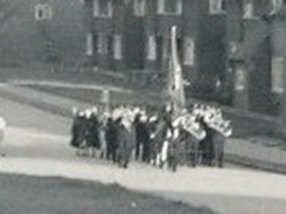 It shows the Salvation Army band playing next to the green which is a memory I will always have of that time. Another sign of the times was kids palying in the street and hardly a car in sight.